Makes ten 2.6" (6.5cm) long AK47 bullet ice cartridges and 6 handgun shaped ice cubes. Available in Bullet and Gun designs. 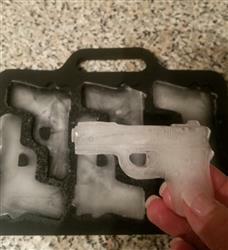 Firearm enthusiasts are sure to appreciate the beauty of the Bullet and Gun Ice Cube Trays. When filled and frozen, it looks just like the magazine of the venerable AK-47. Upon opening, out spills 10 beautiful ice bullets, crystalline and deadly. Mix it up with some pistol shaped ice cubes and serve up a killer cocktail guaranteed to turn heads. Awesome and fun product! We love these molds. Perfect for every drink! I only got the bullet ice cube tray, never got the gun ice cube tray. Still waiting for that one. Bullet tray is cool though. Hello Anita, thanks for your review! Per your order confirmation, you've only ordered the Bullet Tray. Should you have further questions, please let us know. Thank you! I love the bullet and gun ice trays. Cute gift for my gun loving grandson! Excellent, I would buy them again! Great conversation pieces!